Physicists from the University of Würzburg have now succeeded in manipulating this molecule using a special deposit and an electrical field to permanently take on two different states. This could make the molecule suitable as a kind of "molecular switch" for spintronics applications – a trailblazing data processing technology based on electron spin. "We used a manganese phthalocyanine molecule, a dye which cannot be normally switched," Sangiovanni describes the physicists' approach. 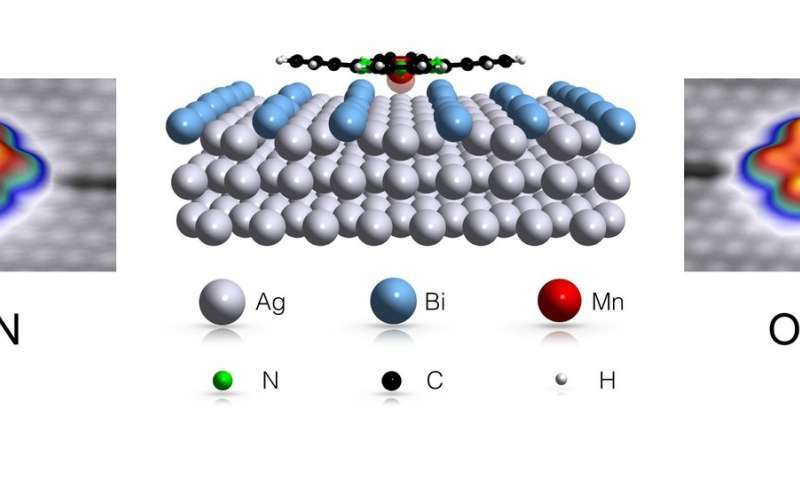 Jens Kügel had to resort to a trick to turn it into a molecular switch: He mounted the molecule on a very special metallic surface built of silver and bismuth atoms. Jens Kügel used a special technique to give the molecule its switching property. When he approached the manganese atom at the centre of the molecule with a very fine tip that emitted an electric field, the central atom changed its position and moved down a bit towards the metallic surface out of the molecular plane. "In this way, the molecule took on two stable switchable states," the physicist says. Normally, molecular switches are synthesised to be intrinsically stable in multiple states. "We have now demonstrated that this functionality can be created also in non-switchable molecules by selectively manipulating the molecule's environment," Kügel and Sangiovanni explain the central result of their paper. The physicists have thus developed a new concept to build molecular switches which they believe will open up new design possibilities in molecular electronics in the future. The successful collaboration of theoretical and experimental physicists at the University of Würzburg is also based on the Collaborative Research Center "Topological and Correlated Electronics at Surfaces and Interfaces", short ToCoTronics, which is located in Würzburg. Its focus is on special physical phenomena – electronic correlations and topological physics, and above all, their interactions which have huge application potential for novel, trailblazing technologies of tomorrow.